5 years ago Kat Gordon launched the 3% Conference. What was intended to be just one event gained so much momentum that companies started to change the way they hired, promoted and marketed themselves based on the movement. At that time only 3% of Creative Directors were women. Today, that number has risen to 11%. This year’s conference theme was inspired by 11-year-old Marley Dias, founder of 1000 Black Girl Books movement. The astute 4th grader noticed that her reading list featured titles that were all about “white boys and their dogs.” When she raised the concern to her mother, she was met with the response: “What are you going to do about it?” That simple, powerful question inspired two days of amazing content and was posed to all attendees on day one. The agenda was filled with a mix of women in creative leadership positions with inspiring life stories and journeys to share. By sharing their stories, they ignited a fire in those rising stars looking to make a change. On the first day, Madonna Badger, CCO of Badger + Winters spoke about her life’s purpose. She talked through her journey in great detail, from the start of her career, the height of her to the darkest days of her life. We learned of her amazing creative victories with the brands she worked with and also about the joy of being a mother. We learned about the tragedy she endured on Christmas Eve 2011, where she lost her parents and 3 young daughters aged 9, 7 and 7 in a house fire. She moved the entire audience with her reflections on life after the tragedy and how she persevered through all of that to move her life and her career forward. • “Impossible is just a small word tossed around by tiny men…” A quote by Muhammad Ali is something she thinks of often when facing challenges as a woman in her industry. Several other presentations during the conference echoed the theme of empathy and how it is a universal currency. We were told to learn how to take risks in our work and to find our voice in this male-dominated industry, because, loud or soft, it’s a voice and it acts as a different vehicle to contribute. If you help create an environment that has respect, you will find that you have multiple voices behind your voice. Throughout the two days it was refreshing to not only hear relevant points of view, but to hear how others have passed through the industry and made their mark, as women. The underlying message from many of the speakers was to know that we all, as individuals, have the power to write our own story and make the change that is needed to help pave the way. We need to ask ourselves what are the twists and turns that got us here. 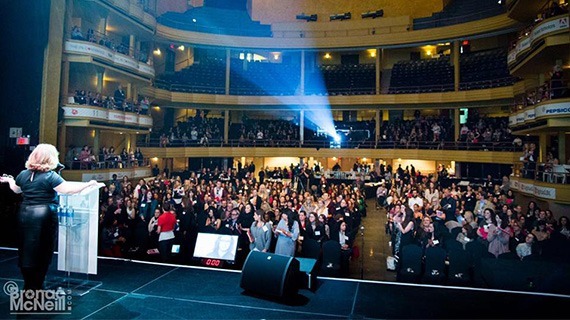 How can we use that path to pave a better path for future women in our industry? How do we support them and be advocates for their journey. At the close of the conference we were asked to reflect on what we learned that week. And again, they posed a question to those in attendance: “What are you going to do?” The answer is this: we will continue to be a voice and a guide to all women in our industry and to help push their voices forward, to help guide and to help navigate difficult issues and topics. We will work to ensure that the women we work with always have a seat at the table and we will be open to what we call “next” by being diverse with creative, our teams, and our solutions. Thank you to Kat Gordon and the 3% Movement for inspiring an industry! For more info: http://www.3percentconf.com. This article was originally published in Diverge.